1 tablet daily, unless otherwise advised. Do not chew the tablet but swallow it whole, preferably during/after a meal. maltodextrin. filler: microcrystalline cellulose, anti-caking agents: talc, silicon dioxide, glazing agent: hydroxypropyl methylcellulose, firming agent: magnesium salts of fatty acids. 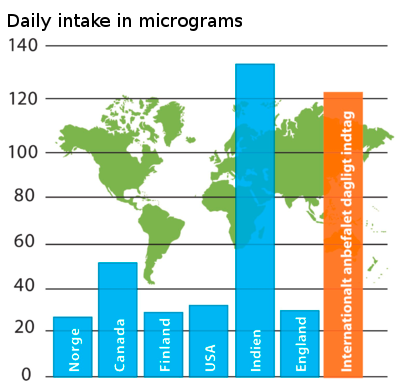 Each tablet of Bio-Chromium contains 100 micrograms of elementary chromium. The chromium used in Bio-Chromium is organically bound meaning it is bound to yeast and natural amino acids (chromium yeast). It has an excellent bioavailability in the body ensuring that it is up to 10 times more absorbable than other approved sources of chromium. Bio-Chromium is made with a patented organic source called ChromoPrecise®, which is a chromium yeast developed specifically to provide optimal bio-availability. This specific chromium source is manufactured in compliance with the most rigid set of control rules (the GMP standard that is normally used to manufacture pharmaceuticals) to ensure excellent quality and safety with exhaustive documentation. Chromium is an essential mineral that contributes to normal metabolism of carbohydrates, lipids, and proteins. In addition, chromium supports biological processes involved in maintaining normal blood sugar levels. 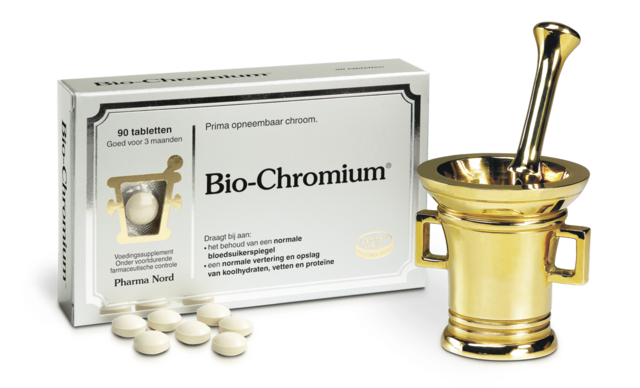 Inorganically bound chromium usually have a poor bioavailability in the body. The effect of a chromium supplement is determined by how effectively the nutrient is absorbed in the body. For many years it was thought that chromium was included as part of a substance called GTF (Glucose Tolerance Factor). GTF were along with chromium believed to consist of the B vitamin, niacin, and the amino acids glycine, cysteine and glutamic acid. The theory of GTF was only partially supported, and the existence of a specific GTF molecule in the body has never been proven. More recent research has however revealed the existence of a unique chrome-binding molecule called chromodulin, which is slightly different from GTF, but with the same characteristics. So when we talk about chromodulin instead of GTF, it's the same benefits we are referring to. The body’s chromium reserve is around 4-6 mg. With increasing age, the concentration of chromium in various tissues may drop significantly. Snacking on something sweet may offer temporary relief because of the quick “sugar fix” that gives immediate energy, but the effect wears off soon after, leaving them where they started. In the long run, such cravings for sugary foods may have a negative effect on body weight. With a product like Bio-Chromium, you can help your body maintain normal blood sugar levels and prevent these situations from occurring. Spices have a high chromium content and that explains why Indian people generally get more of this vital nutrient. Normally, we associate chromium with the chromium-plated fixtures in bathrooms or on motorbikes. The chromium form used for these purposes (industrial chromium) is not part of human biochemistry. We need chromium in its so-called trivalent form. Trivalent means that it is able to form three chemical bonds with other atoms (industrial chromium is hexavalent). Blood sugar is a common term for blood levels of glucose, which is the body’s energy source. The hormone insulin plays a crucial role in metabolising sugar, as insulin enables sugar to enter the cells. Chromium contributes to the process by ensuring that insulin can bind to insulin receptors in the cell membranes. The body’s normal blood sugar values are between 3 and 7 mmol/l.